Is “public engagement” a form of participation? A recent article in BioSocieties by Carlo Caduff is the first one i’ve seen to coherently question the design of public engagement schemes in a particular case, viz. the question of distributing the influenza vaccine. The punchline of his story is that although the government earnestly engaged a subset of the public, and sought to make those engagements representative and deliberative, it nonetheless forecloses on the ability of those people to actually express what they perceive as the nature of the problem. In the specific case Caduff looked at, a public engagement exercise concerning influenza vaccine distribution, the exercise occured just after Katrina, which of course could not help but determine the context of issues like “society” “protection” “emergency” etc, and yet such a context was not part of the “engagement” as such. So is such engagement a form of participation? Can we make sense of it in terms of our work here? In our terms, the organized public is brought into being by the formal social enterprise: in this case it is complex of people from the CDC, Institute of Medicine, National Academies of Science, and other “stakeholder” government agencies, perhaps most importantly the Department of Homeland Security (see these details on the project and the report). The structure of the organized public is also determined in advance, and Caduff explains how the project chose the “right” public. So the OP’s formation and its constitution were heavily guided by the FSE. As Caduff puts it “At the US Department of Homeland Security it was abundantly clear what the citizen voices were trying to say when the protection of ‘society’ was invoked. What the ‘public’ apparently was asking for was ‘critical infrastructure protection’ (211).” So although citizens were engaged in a narrow sense (ranking certain alternatives) they were also pretty obviously there to legitimate a certain technical and political rationality. Interestingly, given our framework, the notion of “resource” is confusing here. The resources is not really the vaccine, but something more like the collective public opinion about what to do with the vaccine. Contrast this with other cases we have looked at, such as PatientsLikeMe, where the resource is collective shared representations of data about individual disease course. In the end, I suspect we need to distinguish between these forms of public engagement and forms of public participation that are less heavily engineered in terms of process. 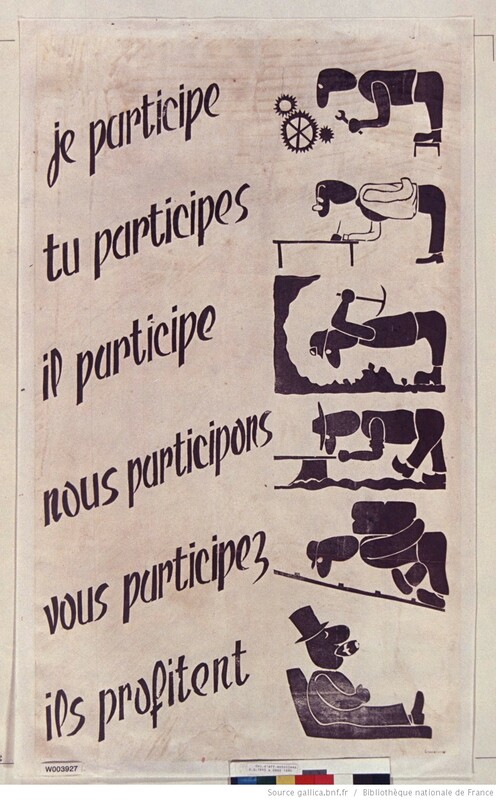 It creates a question for comparison: where is the engineering of participation? Is it in the technical platforms (the Internet) or the structure of an application, the affordances of a medium or the legal constraints, or something more like the nature of the process to which people are subjected? Hey, I think the Tim Wu virus is spreading. Stupid uses of history are popping up all over in TechCrunch… this time, a three part “history” of social networking (Past, Present, Future) that starts off “kids these days…I was into social networking waaaay before it was cool…” but ends up in the standard silicon valley eternal future. Interesting for us why? Because “leaking” is not “participation”– or is it? I’m reading Roberto Abadie’s book on the class of people known as professional guinea pigs: people who are paid to participate in clinical trials and who make a living (or what passes for one) doing trial after trial. The idea of this as a form of work (or labor, or job) bears some nice resemblances to the other cases we are considering, such as participation in Amazon Mechanical Turk or the life of the free lance journalist. The book starts with the claim that many of these guinea pigs recognize their participation as a kind of labor, and a form of labor that consists in suffering for money and a kind of work that doesn’t produce anything. It would be interesting to apply our framework here: what is the resource exactly? Compared to other forms of participation in science, where the inclusion or engagement of people is presumed to be positive, democratizing, etc. this is a clear case where participation is, if not coerced by social circumstances (poverty, joblessness, lack of skills, ease of access to money etc) then at least a morally suspect version of participation. In terms of our analysis, there is obviously no participation at the level of goal setting or at the level of task design (i.e. clinical trial design)–only participation in the execution of the task. What’s interesting here though is the creation of an OP by an FSE (pharma companies, who do a ton of work to locate and enroll trial participants) which includes a sub-OP of “professional guinea pigs”–people who come back over and over, communicate with each other, organize and resist. In the Nature of Participation. All too easily do we identify the need for and importance of participation: participatory democracy, audience participation, user-participation, participant-observation etc. Usually, it’s a good thing, though for the darkly minded, it’s akin to exploitation—free labor. But rarely, if ever, is it simply identified and distinguished. This lab aims to make its object of study participation in its “natural” settings, the changing ecology of global information and communication. The process or fact of sharing in an action, sentiment, etc. ; (now esp.) active involvement in a matter or event, esp. one in which the outcome directly affects those taking part. Freq. with in. Cf. audience participation at AUDIENCE n. 7d. In this definition, there is a loop: one participates because the outcome directly affects the one participating. Participatory democracy, by this definition is not representative but direct. In the nature of participation there are proximate and distant outcomes, and only those whose effects are direct really mean much in the way of participation. The Internet changes all this, of course, with the proliferation of modes of direct participation. But how, how long and with what effects? In what does one participate? How active is that participation? Who controls or displays the outcomes (be they proximate or distant)? And how do you know when that participation affects you? But it is not only the participant’s perspective that is at stake here: increasingly, and for obscure reasons, those who provide the capacity for participation expect something as well. For instance, citizen science creates an expectation not only for participants to become involved and see direct benefit, but it also creates an expectation that science might be done differently, end up with different results. Similarly, a project like Current TV or Indy Media began not just with the hope that participants would see themselves making media and having an effect, but that the media itself would be transformed (if not destroyed, some fantasized) by this practice of street-level democratizing journalism. Always we have assumed that more participation makes democracies better, but rarely before now have we been able to so precisely measure, visualize, and form expectations of that participation. Of course by 2010, the callow fantasies of a liberating cyberspace, of a democratizing web, or of the Internet as a neutral and equalizing force have come to an end, and the future of participation looks messy. The Nature of participation is ever-changing. And by this we mean, the place, the ecology, the environment within which participation becomes as possible as foraging, dwelling, preening or sleeping for that matter. There is no return to a 20th century of mass democracy, but nor have we actually seen a revolution, despite it’s frequent announcement.